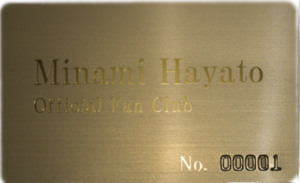 HAYATO PROJECT is a fan club aiming to support Minami Hayato activities. Anyone with a feeling of praying for success can participate. Please complete the temporary member registration from the image below. Please log in with the registered address / password and complete the profile. We have prepared a VIP class for supporters who support us more. After registering as a general member, please pay VIP payment * 1. We also made a plan that you can purchase at the shop or Gift certificate pay(Amazon gift certificate, iTunes card, Google Play gift card, etc.). * 1 … will be automatically withdrawn every 6 months via Paypal (credit or debit card). It is possible even without paypal account. We are planning to enhance the contents. For membership, it is only from the Internet. Please fill in the application form and submit it. Please be sure to fill out the address from the prefecture name and fill in the apartment name / room number, without omitting it. The registered address (mailing address shipping destination) is limited to Japan. In addition, there is no setting of the capacity and admission acceptance time by HAYATO PROJECT. You can join us at any time. Copyright © 2019 HAYATO PROJECT All Rights Reserved.